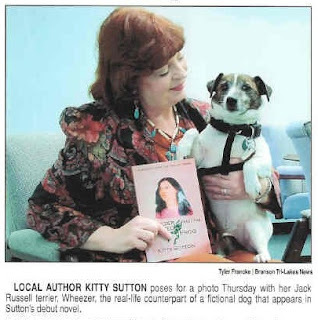 Kitty Sutton is the author of a series of books she calls "Mysteries from the Trail of Tears." She claims she has uncovered a hidden history of the Cherokee Nation after the Trail of Tears. She also claims she and her family are Cherokee. 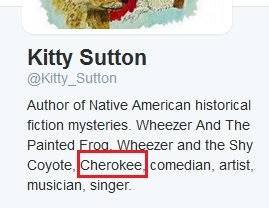 Despite her claims, Sutton is not Cherokee. She's not registered with any of the three federally recognized Cherokee tribes and she has nothing in her genealogy that suggests she has Cherokee, Osage, or any other American Indian ancestors. Another researcher and I traced Sutton's genealogy and researched every line back to, at least, the time of the Trail of Tears. The family was never living among the Cherokees (or any other tribe) and they were always found listed as white citizens of the United States. If I was inclined to do so, I could write as many posts about Sutton's ancestors as I did about US Senator Elizabeth Warren's family. That is not necessary (yet) because Sutton bases her entire claim (for now) on one ancestor, her paternal grandmother, Anna Miller. 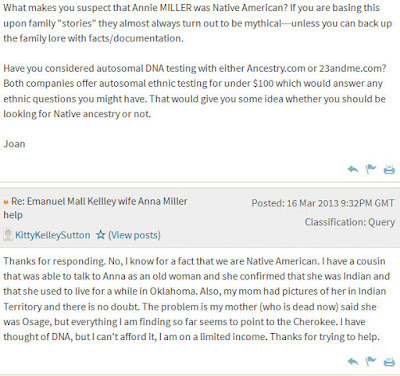 March 16, 2013, Sutton made this post on a genealogy message board asking for leads on her grandmother who she "knew" was Native American. One of the people trying to help her with her query specifically asked Sutton if she was basing her claim on family lore. Sutton said no and that she knew for a fact her family was Native American. 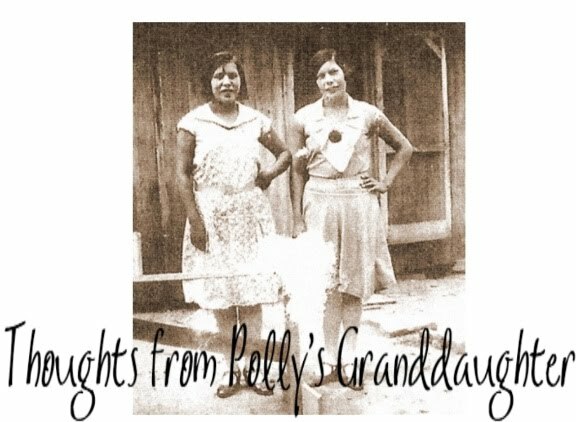 May 26, 2013, Sutton posted a picture of her grandmother to her tree on Ancestry and wrote that the picture showed her grandmother was Native American. 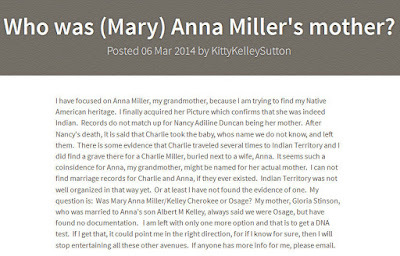 March 6, 2014, Sutton posted a message on her Ancestry Sutton Family Tree suggesting her paternal grandmother, Anna Miller, was not the child of Nancy Adaline Duncan, based on a marriage date. 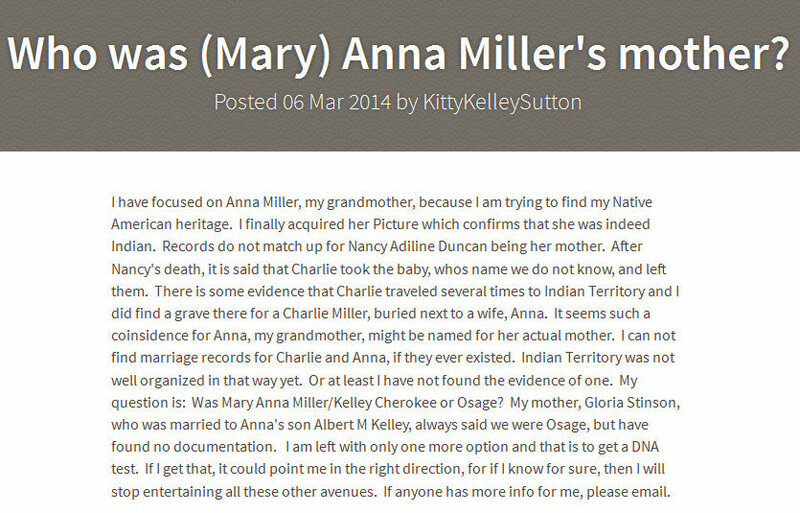 It appears she then surmised Anna was the child of Charlie Miller and some unknown Cherokee woman. March 19, 2014, Sutton left a long, angry comment in response to an article about disenfranchised Indians. 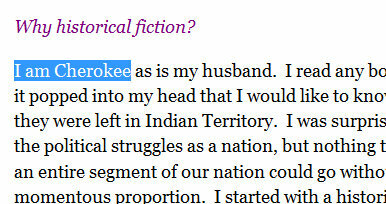 She basically said she's Cherokee and Osage, but she can't prove it, but despite that, she's still no less Indian. By March 24, 2016, Sutton was claiming her Native American grandmother was "adopted out" to a family in Missouri and the family name was lost to time. 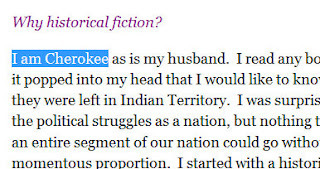 The problem with all this, every last bit of it, is that Kitty Sutton has apparently created a fictional Cherokee ancestor that is as imaginary as the characters in the stories she writes. Her grandmother was not a full blood Cherokee child adopted out (of the Cherokee Nation?) to a white family in Missouri. She was a white baby born in Missouri into a white family that were citizens of the United States. 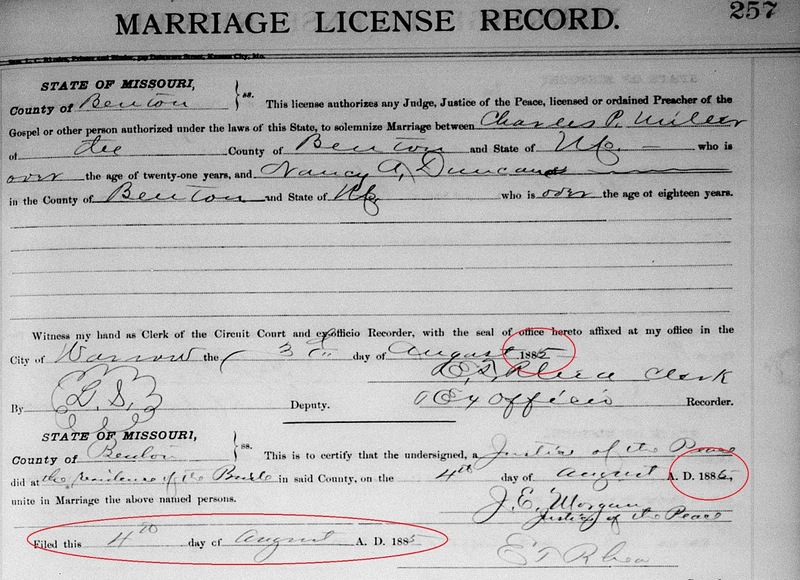 Charlie Miller and Nancy Adaline Duncan were married August 4, 1885, in Benton County, Missouri. Approximately six months later, February 6, 1886, Anna Miller, their daughter was born. We all know the gestational period for human babies and we can all see the records indicate Nancy likely conceived Anna before she married Charlie. While some might be shocked to find records such as this, we genealogists know this was not a rare occurrence. There's no need for moral judgement. It is what it is. It is not a problem that would indicate a child was "adopted" as Sutton says, but instead a piece of documentation that suggests a child was conceived before marriage. 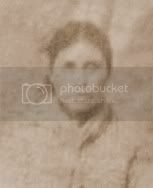 1900 as Mary A. Miller; 14 years old; born Feb 1886 in Missouri; daughter of Charles Miller, a widower; living in Adair, Camden County, Missouri. Race - white. 1910 as Anna Kelly; 23 years old; born about 1887 in Missouri; wife of Mell Kelly; living in Lincoln, Pratt County, Kansas. Race - white. 1920 as Anna Kelley; 35 years old; born about 1885 in Missouri; wife of Mall Kelley; living in Parsons Ward 4, Labette County, Kansas. Race - white. 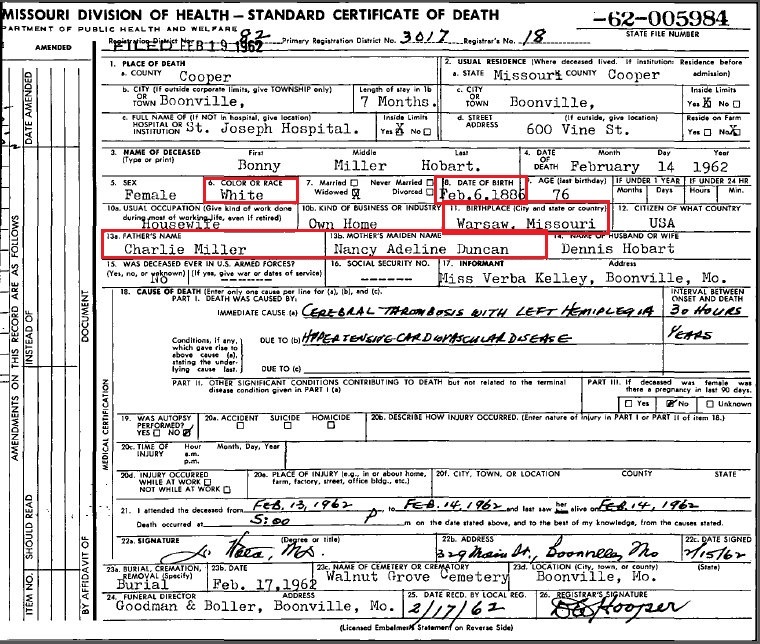 Additional information on Anna Miller (who started using the name Bonnie later in life) is found on her death certificate. The informant was Anna's daughter, Verba Kelley. Verba said her mother was white; born February 6, 1886 in Warsaw, Missouri (which is in Benton County); and the daughter of Charlie Miller and Nancy Adaline Duncan. The documentation supports the information Verba gave for her mother's death certificate. There is no reason to doubt any of it. The only reason it has come into question is because Kitty Sutton, granddaughter of Anna Miller, has either poorly researched her ancestry or refuses to believe the documentation she's found. Clearly Sutton wants to be Cherokee and she will stop short of nothing to try to convince herself and others that she is Cherokee. That's not the way it works though. No matter how much one might try to twist, misinterpret, or misrepresent records, they can't find what isn't there. This is why Sutton isn't able to prove Cherokee ancestry. She simply isn't Cherokee. While this may appear to be just another case of wannabeism gone bad, it's more than that. According to Sutton's website, the National Park Service has accepted Sutton's books for their catalog which allows any National Park Gift Shop to order them and sell them. Sutton advertises this as proof that she's discovered an accurate history that has never been revealed until now. 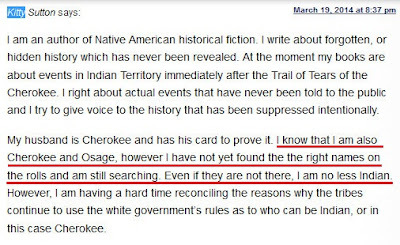 To those of us who study the behavior of fake Cherokees, the claim of "hidden history" always sends up a red flag. We know that eventually those fake Cherokees will try to use the idea of undiscovered facts in an effort to authenticate their family as Cherokee. Sutton appears to be doing this in her fourth book. She claims the story line has a strong connection to her family because her grandma was adopted "out" to a white family in Missouri. As bad as that is, it is not the worst of it. Sutton now promotes herself as a Cherokee historian, of sorts, who has done extensive research on Cherokee history. She travels throughout the Ozarks (southern Missouri and northern Arkansas) to Cherokee historical sites giving presentations on the Trail of Tears because she believes our history has been recorded incorrectly. If Sutton can't do her own genealogy accurately, how in the world can she be trusted to do any other research correctly? Think about that. When she looks at the documents on her own family, she doesn't see what's there. Instead, she sees what she wants to be there. Now that we know that, any detail that comes from her research of history becomes suspect. 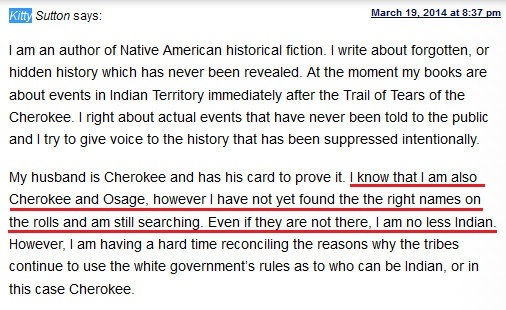 At this point in time, we should consider Sutton's claim of Cherokee (or any other tribe) debunked. Should she "line jump", which is common in false claims, I'll address that when it occurs. As previously stated, her ancestry has been traced in every line dating back to the time of the Trail of Tears. Nothing indicates Indian ancestry. If Sutton respects the Cherokee people, she'll stop claiming to be one of us. If she doesn't, she'll cling to her story as if her life depended on it, continuing to exploit our ancestors for her own personal gain. Only time will tell which direction she'll go. *Line jumping is when a fake Cherokee has their false claim debunked in one line of descent so they "jump" to another line in their family and then claim that one is "Cherokee". *Census records were found on Ancestry.com. Maybe I missed it in the article, but I am correct to assume authoring a book does not come under the umbrella of Indian Arts and Crafts Act? It does not fall under the federal IACA. Lawmakers in Oklahoma are currently considering whether to tighten up the law in their state to include both written works and performing arts, I believe. With that said, while we can't stop her from writing books on whatever subject she may choose, we can oppose her promoting herself as Cherokee; speaking at events concerning the Trail of Tears; and having her books sold at National Park Service gift shops as Cherokee history. Yes, you are confused. Let me help you out. According to census records, the US 1900 to be exact, Anna was born Feb 1886. That is further supported by her death certificate that says she was born Feb. 6, 1886. Nancy and Charles were married by then and there is no reason to believe Nancy was not the mother of Anna since the daughter that gave the birth date on the death certificate also listed them as Anna's parents. As for your belief that Anna was Cherokee or Osage, there is no genealogical documentation to suggest that and if you are truly a genealogist, you'd know that. Also, you are not my "sister" and until you actually have proof that you have Cherokee ancestry, please refrain from telling me how I should or should not represent MY people. AHAHAHAHAHA Awww you're funny! Sweetheart, I don't have to prove anything to you. You are nothing but a hateful wannabe Genealogist and a very poor keyboard warrior/ "journalist" (which is a joke). I do have my United States Department of the Interior Bureau of Indian Affairs Eastern Oklahoma Regional Card (white laminate) along with my blue Cherokee Nation Department Card. both signed by Linda o'Leary and the blue also signed by Bill John Baker and embossed. Again you DO NOT KNOW WHAT YOU ARE TALKING ABOUT......again. You're death certificate says born in Boonville. Annie was born in Camden County, Macks Creek which is stated on the Marriage certificate. Of course there is more to this person and several are trying to find it. There is an issue with her name first of all....starting as Mary Anna Miller to changing to Bonnie Miller Hobart. This itself is an issue. Bonnie not being her first name and Miller apparently not the middle, but on a document. The marriage certificate is also a legal document. You know, that things in life happen and people hide things or write down incorrect dates, etc. Which is why we have soundex and + and - for years to find the family member. Sometimes it's NOT cut and dry. I have a friend that, her Husband is 100% Native American. Adopted. Found the biological family, and the biological father has passed. Indian Affairs will not add him because he can't get a signature from a dead father. The system is ABSOLUTELY NOT FOOL PROOF. After all, look, they let you in. Genealogy is about tracing the ties, which is currently still being worked on by myself and I'm sure Kitty. Which also can be said for thousands of others and their trees. Whew, you have a lot of work to do, to go after all of them too while they hunt down their families. To really sum this up. You, just want to fight and be nasty when people are really trying to find their families. It's sad how, sweetheart, unfortunately you, MY PEOPLE decide to act this way and just because you say I'm not, means absolutely NOTHING to me hunny. Because frankly you are nothing. I 100% know who I am and what I am and who I stand for and THAT is ALL that matters. At least I do represent the decent of MY PEOPLE, Cherokee. Kitty, if you ever see this. I want to thank you for taking the time and research to write your books and talking at events to make people aware of my peoples struggles. We are not all hateful like Twila. Regardless of what she has posted, don't care if you are white, brown, black, blue or orange. At least you are doing something about it, which is more than Twila can say. There's a lot to be said about this comment, but much of it I'll let go. But, something Cherokees will understand is "Linda O'Leary" signed your card? That says a lot. Interesting no one can find your name on a voter's list. Apparently you are a little disconnected from the rest of us, if truly a citizen, and don't care about our tribal elections. But, with that said, now down to genealogical business. "You're death certificate says born in Boonville." "No it doesn't. It says she DIED in Boonville. It says she was BORN in Warsaw, Missouri, which is in Benton County, the very county her parents were married in and a county that borders Camden County, Missouri, the county she was living in with her father and brothers in 1900." "Annie was born in Camden County, Macks Creek which is stated on the Marriage certificate." "No the marriage certificate does not say that. 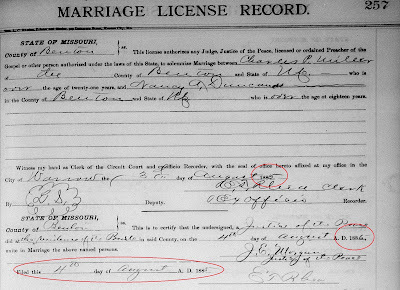 The marriage license says she LIVED in Macks Creek, Camden County, Missouri at the time she got married." "There is an issue with her name first of all....starting as Mary Anna Miller to changing to Bonnie Miller Hobart. This itself is an issue. 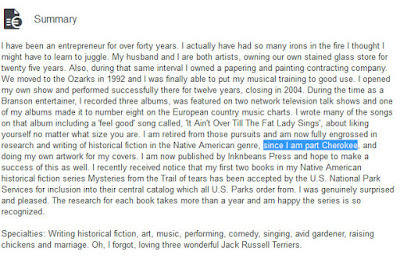 Bonnie not being her first name..."
"There are many reasons she could have started using a different name. It appears she did so AFTER she married Hobart. Perhaps she was never legally divorced from Mall Kelley and so used a different name to marry Hobart. Who knows? 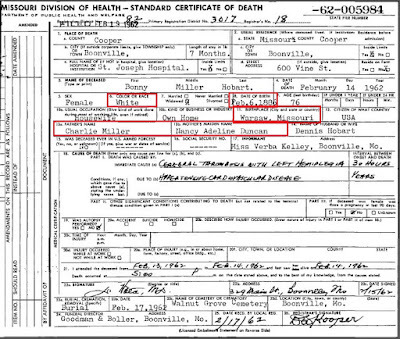 But, Bonnie/Bonny Hobart and Anna Kelley nee Miller have the same parents, same birthdate, and same children. All the documentation indicates they were the same woman." Those are the facts. Any armchair genealogist can see it. 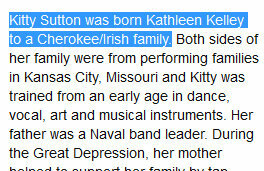 Kitty Sutton, and apparently you, had free genealogy done for you. It has apparently been a brick wall none of you could break through and I did it for you. You're welcome. Research is research and not always on a document. The history alone will start to tell the story. Remember, Native Americans were a nothing to the Government. Must follow the path and really dig into Anna Millers "life". I love genealogy, but this one is a pickle, meaning Anna. One more thing. I'm Cherokee and Osage, and my birth certificate says white. Humans are the ones filling out the information and are not always correct. It isn't a pickle when you look at the correct person. The woman you posted the info above is not YOUR Anna Miller. Your Anna died Feb 16, 1962 per her death certificate posted above. 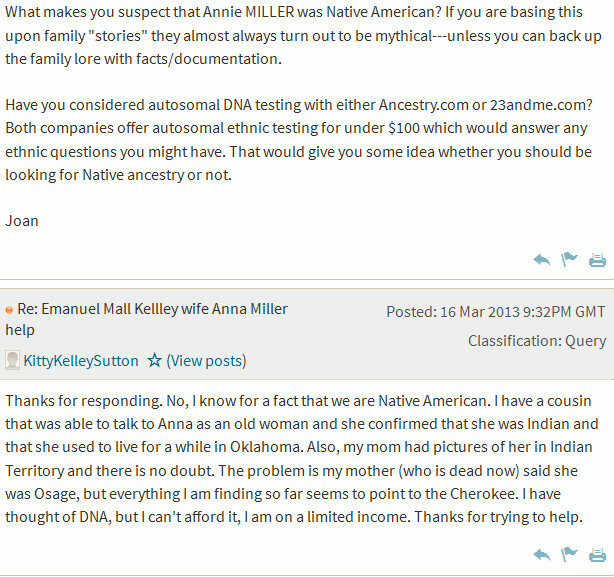 And as for your claim of being Cherokee or Osage, it's false if you are claiming it through Anna. Every record indicates she's white. Every. Single. Record.